I have put this off for several months knowing this project would be huge. I have this vision and I know it’ll take lots of work to get this piano into a functional piece of furniture. I had several ideas for what I might use the piano for and in the end I have decided to use it as a desk and storage area for all of my craft supplies. The final step before being able to start the rebuilding process was to remove the 458 little pins that I believe act as guides for the strings. I kept avoiding this job, but the “pins” are quite sharp and I knew that they needed to be removed if I wanted to use the interior of the piano at all. 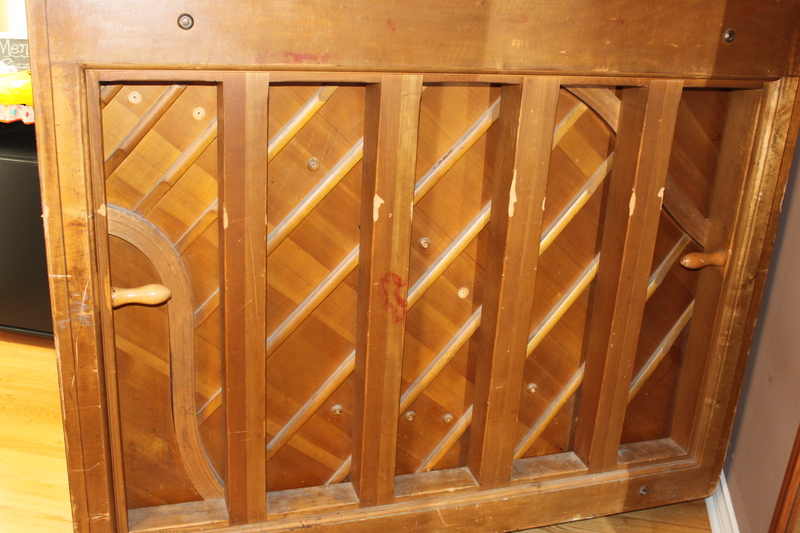 With most of the pins removed, I can now begin the process of planning what and how I am going to get this former piano to be the all in one storage work station I envision. In my research, I wasn’t able to find anything that matches my vision, but I was able to take bits and pieces from the designs others used. I will have to see how hard this is for me to pull off, but one thing I would like to do is use the concept Vicky Newman described in her piano make over in which she made the upper cavity of the piano into a shelving space and converted the front panel into a door that slid up into the top of the piano like a “barrister style” bookcase. Here’s a shot of Vicky’s piano. I will definitely be using some of Vicky’s ideas when reconstructing my piano desk, but I am really hoping to use the back for storage as well. As a scrapbooker, DIYer and crafter, I have so many small objects to store and I can’t help but think how cool it would be to have all of those supplies hidden in the back of the piano. I haven’t thought out the logistics yet, but I think it will work well. The key will be where the piano will eventually sit. If against a wall, the casters need to be strong enough and of good enough quality not to damage my hardwood floors when sliding it in and out to access the storage. If I choose to use it more as a divider with the back exposed, I will need to consider what the storage area will look like to make it visually appealing. Not sure, but the concept is exciting! I’ll keep you posted, but of course, I will only be working on it between the adventures of our Manitoba Stay-Cation. Posted on July 9, 2014 by Cindy Roy •	This entry was posted in DIY and Upcycling and tagged piano to desk, piano upcycle, repurposing old piano. Bookmark the permalink.